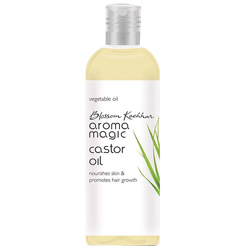 Buy Aroma Magic Castor Oil Nourishes Skin & Promotes Hair Growth, Relieve Pain from Arthritis & Rheumatism. A vegetable oil with powerfful therapeutic properties, derived from the beans of the castor plant. When combined with essential oils, ideal for massages. For centuries have been used for anti inflammatory and anti bacterial properties for the skin. Effective in relieving you from pain from arthiritis and rheumatism. Use in your head and scalp massage to give your hair a lustrous shine. An ideal natural skin tonic to keep your skin soft, supple and beautiful.